It’s nothing but lies. It’s nothing but manufactured, total BS that has now become a reality to these people. And all Trump has to say, “Well, you know, nobody really knows.” (laughing) And they blow up. And this Little Jim Acosta is literally making a fool of himself. He’s a CNN reporter, and he’s the guy that went bat nuts about two weeks ago over Trump refusing to call on him and then referring to CNN as fake news. And then the CNN mock wrestling gif. He is losing his mind. They all are at CNN. So Trump’s press conference is in Poland — oh, by the way, let me tell you about this. There’s another thing about Poland. The Drive-By Media today, a couple different places, reported that Trump is so unpopular in Poland. This is a flat-out lie. I mean, this is just total flat-out fake news. They reported Trump as so unpopular in Poland that they had to bus in the few supporters in the country they could find that would cheer Trump. And the Drive-Bys are outraged. CNN’s been running a banner all day: “Trump Blasts America on Foreign Trip.” “Trump Blasts Intel Community on Foreign Trip.” “Trump Blasts Obama.” Of course, in a sense it’s true, but they have no context. What Trump’s referring to is the intel community, weapons of mass destruction. He’s being asked by the media, “So… so do you think the intel community was right when they said 17 different agencies realized that you colluded with Russia? Do you think that’s right?” And Trump said, “Well, I don’t know that anybody really knows for sure what happened,” and they blow gaskets. Jim Acosta ran to Twitter (paraphrased), “Trump is an idiot! Trump is a buffoon! It is 17 intelligence agencies who all agree that the Russians tampered with the election to try to benefit Trump!” Well, as you’ll remember from yesterday’s show, the New York Times and the AP had to do massive corrections and massive deletions and massive pullbacks because it isn’t 17; it was only three people — three people who agreed with James Clapper, who was Obama’s Director of National Intelligence. It was reported in January that 17 intel agencies all agreed that Russia tampered with Putin to benefit Trump. They had to pull that back. They did the correction over the weekend. We heralded it major yesterday. Jim Acosta doesn’t know. Jim Acosta, a reporter at CNN, simply doesn’t know that the AP and the New York Times had to issue the corrections. It isn’t 17. So he’s out there tweeting what an idiot Trump is. He’s tweeting what a liar Trump is, that Trump doesn’t know, that Trump is ignorant. When in fact it’s Acosta who is the CNN reporter who — according to job description — should be on top of this stuff. I mean, these people, the New York Times is their bible. They should know everything in the New York Times, and it is becoming clear that people that work for CNN are among the least informed people in Washington. It’s just delicious. It is fascinating. I was reminded. I didn’t even… I had forgotten this. John Hinderaker at Power Line had posted something back in 2009 about CNN. The title of the tweet I think, I think, is, “Rush Is Out.” The post was about was how CNN knowingly broadcast fake quotes attributed to me during the period of time it had been announced that I was part of a minority ownership group to buy the St. Louis Rams. And Trump said “I know why. ‘Cause he didn’t think I was gonna win. He knew Hillary was gonna win, so he didn’t want to taint it. But Obama’s the guy that let it happen. Don’t ask me.” And they blew up at the Drive-By Media. Here is Dana in Beacon, New York. Welcome. Great to have you with us. How are you doing? CALLER: Professor, thank you very much. Just two points I want to make. I’d like to remind the Drive-By Media that the former president outlawed or canceled a defense missile program for Poland when he came into office. And as for the Russia unmasking or the Russia collusion situation, I think we were getting too close to the facts about Michael Flynn and Loretta Lynch and James Comey and Susan Rice, that all of a sudden the media is saying, no, pat down the Russia, pat down the Russia thing. I believe we were getting close to the kingpin of the real story that you just stated about Obama knowing more than what he’s letting up to. And I’d like to say to the Polish people, America loves you. Thank you. RUSH: I’m glad you called. What Dana’s referring to — that’s a good point. Obama did cancel the placement of defensive missiles in Poland that would defend them against any potential missile attack or other kind of attack from Russia or any of the Russian client states. Trump took those missiles with him and announced to Poland that they’re going to be deployed. They weren’t on the plane. I mean he took the policy with him. He reinstated what Obama had canceled. And the media is trying to do stories today that Trump is so unpopular in Poland that the Polish government had to scour the country, could only come up with 5,000 people, had to bus them in. It is the exact opposite of what really happened. They bused people in to control the crowds, there were so many that wanted to get there. In the meantime, they will not tell you that the protests in Hamburg are bought and paid for, including transportation, people bused in and told to just raise hell, for whatever reason they want. THE PRESIDENT: I think what CNN did was unfortunate for them. As you know now, they have some pretty serious problems. They have been fake news for a long time. They’ve been covering me in a very, very dishonest way. CNN has really taken it too seriously and I think they’ve hurt themselves very badly. Very, very badly. And what we want to see in the United States is honest, beautiful, free, but honest press. We want to see fair press. I think it’s a very important thing. We don’t want fake news. Folks, CNN has been a bad actor for I don’t know how long. You know, I don’t even quite know how to talk about this, ’cause I don’t ever want to sound like a victim. But they have reported some of the most outrageously bogus things about me over the years. I’ve been dealing with and taking on the media since this program began. The whole media despises me, and they should. But I’m happy to see Trump doing it. He’s just got them totally off balance. And for so many wonderful reasons that are being exposed. They’re really a bunch of phony pretenders to competence, pretenders to elegance, pretenders to fairness, pretenders to journalism. It’s not even what happens anymore in what is called the American media. Up next was the NBC chief White House correspondent. Her name is Hallie Jackson. My guess is that you’re gonna see Hallie Jackson on the Today show in about five years. There is a career path at NBC for White House correspondents. Savannah Guthrie used to be one. The only one who ended up on the Today Show who wasn’t a White House correspondent or a reporter was Katie Couric. THE PRESIDENT: Well, I think it was Russia, and I think it could have been other people in other countries. It could have been a lot of people interfered. Barack Obama, when he was president, found out about this, in terms of if it were Russia, found out about it in August. Now, the election was in November. That’s a lot of time. He did nothing about it. Why did he do nothing about it? They say he choked. Well, I don’t think he choked. I think what happened is he thought Hillary Clinton was going to win the election, and he said, let’s not do anything about it. Why did he do nothing from August all the way to November 8? Why did he do nothing? His people said he choked. I don’t think he choked. 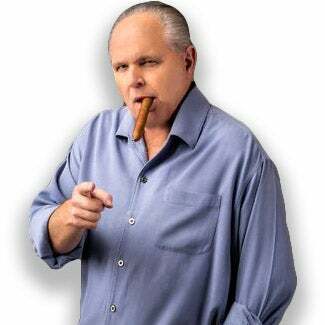 RUSH: Do you realize, folks, imagine CNN a bonfire and this answer is throwing gasoline at ’em. I mean, the tone of the question: “Okay, once and for all, yes or no, definitely say that Russia interfered in the election.” You know, we don’t know this. We literally do not know it. We have only been told. We’ve been told in an 8,000-word story in the Washington Post two Fridays ago. And there was no evidence presented. There was none. It was just allegations, a document, a phony dossier, any number of other questionable documents that John Brennan at CIA thought was so crucial and everybody took to Obama. To this day they will not turn that server over. Because on that server no doubt is evidence of how the Democrat National Committee rigged the primaries against Bernie Sanders. Now, the Democrats have been wallowing and complaining and just caterwauling about Russian interference, and the media has been as well, leading the charge. Nobody has presented any evidence. I’m not talking about votes. I’m talking about any evidence that they tried to interfere beyond what the Russians are trying to do every day. Russian intelligence, ChiCom intelligence, Turkish intelligence, Israeli, everybody’s trying to penetrate various areas of our government, the Pentagon, the CIA, the NSA. It’s ongoing. It’s multiple times a day. What they’re trying to make you believe is that out of nowhere one time exclusively the Russians tried to tamper with our elections. They have offered no evidence. And they will not let that server of theirs from the DNC be forensically examined. And if there is any evidence of Russian attempts, it’s probably on that server, and that’s why they’re not letting anybody see it. My guess. My also guess is, as I say, there’s evidence that they colluded against Bernie Sanders with Hillary. Ask yourself that. Why won’t the Democrats turn over the server? If it’s so, so important to find out whether the Russians colluded, then why won’t they help and turn over their server? Because they’ve alleged the Russians hacked it. Instead, they hired a third-party outfit, CrowdStrike, to forensically examine it. Whatever CrowdStrike says we’re supposed to accept, and that’s it. So Trump’s answer here, this infuriates ’em, Obama knew. The Washington Post, 8,000 words, Obama knew. He knew that Russia was interfering. But Trump’s also said, “We don’t really know. We’re not sure who did.” But Obama claimed that he knew, and he didn’t do anything about it. And it wasn’t from just August to November. Obama didn’t do anything about it all the way ’til December. And in December all he did was expel 35 Russian diplomats. He didn’t do anything about it. That Washington Post story makes it out to be one of the greatest crimes committed in international espionage history. And yet Barack Obama did nothing about it. So here’s Hallie Jackson, future hostette, Today Show, demanding from Trump once and for all whether he’ll admit it, whether he’ll admit the Russians hacked, whether they did, and what he thinks about it. RUSH: So he rammed that down their throats twice. They’re the ones who have no answer for that. Trump’s answering their question. “Yeah, if you want me to say it’s Russia, it’s Russia. I don’t care. You have no proof either way. It might have been Russia, might have been somebody else. Whatever you want me to say. The real question is, Obama thinks it was happening; Obama said it was happening. The Washington Post and New York Times reported it. He did nothing to stop it. That’s where you people in the media have really gotta turn your attention. “Why didn’t your brave, courageous president try to stop this if it was so outrageous?” And the answer is abundantly clear: You all thought Hillary Clinton was gonna win in a landslide, and you didn’t say a word about this before the election because you didn’t want her victory tainted with the allegation that the Russians had cheated against Trump because they wanted Hillary to win. You didn’t want that to be part of the story. This is so transparent. These people deserve every bit of mockery that Trump can send their way.